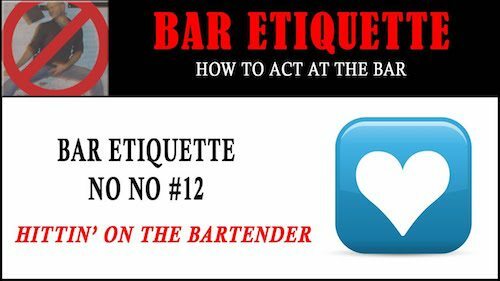 Here’s the last video in our bar manners series. So you’re at the bar, right? And you see this hot little bartender, right? And you’re like “oh what, I’m going to get her by the end of the night”. So you start getting your drink on… as you’re getting your drink on, you’re getting a little more confident. A little more confident. As the confidence comes, so does the hand touching when you order your next drink. Maybe you’re so bold as to even rub the ear or something. You know, you’re flirting… flirting. It’s a bartender’s job to flirt, ok? That doesn’t mean she likes you. And it definitely doesn’t mean that she wants to go home with you, or wants your number. Of course, there’s the rare occasion when she actually does… But, generally speaking… no! 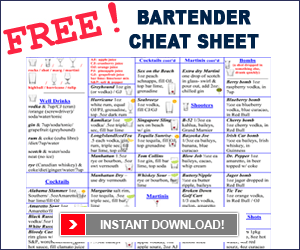 Don’t hit on the bartender, don’t touch the bartender; try not to flirt with the bartender too much. Order your drinks. The bartender’s busy. The club’s busy. You’ll get your drinks fast, everybody else will get their drinks fast, everybody will be happy. If she likes you, she’ll let you know.